Up to 8 million tons of trash - plastic bags, bottles and toys, just to name a few items - ends up in the world’s oceans each year. The astounding figure, much higher than previous estimates, could increase tenfold in the next decade, researchers warn. Along with colleagues from the US and Australia, Jenna Jambeck from the University of Georgia studied the sources of ocean-bound plastic and developed models to estimate their annual contributions worldwide. Jambeck says their estimate of 8 million metric tons going into the oceans in 2010 is equivalent to "five grocery bags filled with plastic for every foot of coastline in the world." Given that this annual input goes up each year, the estimate for 2015 is "about 9.1 million metric tons," she says. These findings are published in the journal Science. Until now, researchers didn't have a full picture of the amount of plastic that makes its way from land to sea each year. It had been previously calculated that there were about 270,000 tons of plastic waste currently floating in our oceans. This didn't take into account the waste that had already sunk, however. "In 2025, the annual input would be about twice the 2010 input, or 10 bags full of plastic per foot of coastline," Jambeck warned. "So the cumulative input by 2025 would equal 155 million metric tons." The researchers combined data on solid waste from 192 different coastal countries with factors such as population density and economic status. They identified the major sources of ocean-bound plastic and listed the 20 countries that contribute the most. It turned out that China was responsible for the most ocean plastic pollution per year with an estimated 2.4 million tons, about 30 percent of the global total, followed by Indonesia, the Philippines, Vietnam, Sri Lanka, Thailand, Egypt, Malaysia, Nigeria and Bangladesh. The US was the only rich industrialized nation in the top 20, and ranking No. 20. Coastal EU nations combined would rank 18th. A study that came out last year stated that at least 88 percent of the surface of the world’s open oceans is polluted by plastic debris. The results were based on over 3,000 total ocean samples collected around the world by Spain’s Malaspina science expedition in 2010. Meanwhile, according to researchers, uncaptured waste (trash that is littered or lost from waste management systems) is the biggest source of ocean-bound plastic debris in the world. "Our mismanaged waste is a function of both inadequate management - open dumping, for example - and litter," Jambeck said. "This mismanaged waste goes uncaptured, meaning that it then becomes available to enter marine environments." According to the researchers' models, a country's population size and the quality of its waste management systems stand for the amount of mismanaged waste that it generates. "We need to make sure that we are collecting and capturing solid waste and plastic around the world," according to Jambeck. "Second to this is what we do with it... If we at least capture it, it's not going to go into the oceans." 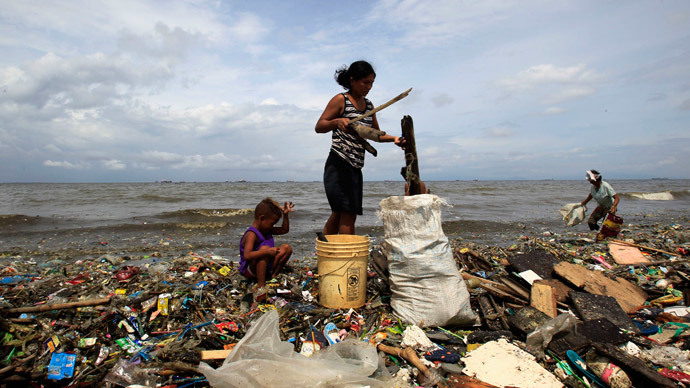 "We need to wake up and see our waste," she told AP. "I think the problem in some ways has sort of snuck up around us."